Garden turnips can be yummy! Use a large frying pan to cook the turnips in hot ghee and duck fat for about 5 minutes, turn cook other side for five minutes until lightly browned. Remove turnips from the pan. 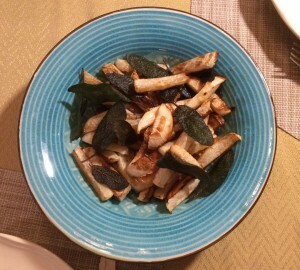 For optional garnish, fry sage leaves in the hot fat that is left in the pan until they are crisp. Pour remaining fat over the turnips. Sprinkle the fried sage leaves over the top. Serve. Wonderful ideas. Can’t wait to try these out at home.